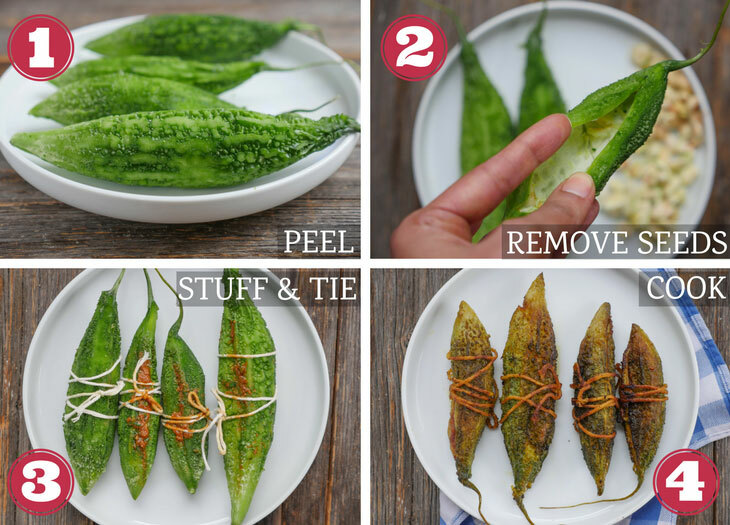 If you like karela (bitter melon), you will LOVE this aloo stuffed karela! It’s so easy to make in an instant pot! 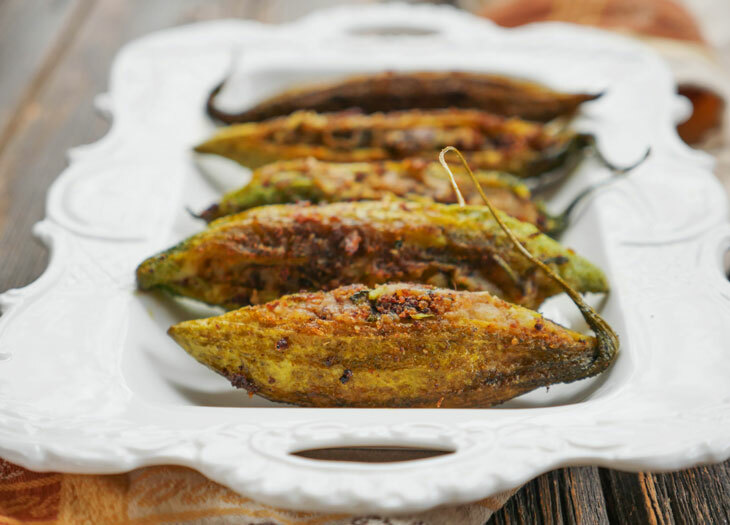 This recipe is also known as bharwa karela, which just means stuffed karela. You can stuff bitter melon with anything (onion masala, chutneys, etc) but today, I’m sharing a recipe that calls for a spiced potato filling! Before I tell you about the dish though, there’s something you should know. I have three other bitter melon recipes on my blog and in all posts, I share a warning with my readers: bitter melon is a love it/hate it kind of fruit. And chances are that if you didn’t grow up eating it or haven’t yet acquired a taste for it – that you’re going to be in the latter category. If you’re feeling adventurous and still want to give bitter melon a try, then this is the recipe for potato stuffed bitter melon is the one to make. It’s a good “first time” karela recipe because it calls for potato which really helps to balance out the flavor of the bitter melon. The potato filling has what we call a “chatpata” flavor meaning that it’s pretty tangy. The tangy flavor in this filling is from amchur powder (dried green mango powder). This tart and salty filling really mellows out the bitterness of the melon. If there’s any chance of you liking bitter melon, then this is the recipe that’ll do it for you. Now IF you are already a fan of bitter melon, then get ready for an incredible way to prepare it – because you are going to love this! To make this recipe, first peel the bitter melon (save the peels for this chilke ki sabzi recipe), then make a slit on one side and remove all of the seeds. After that, stuff the melons then tie them up with kitchen twine. The twine helps to keep the stuffing inside when you shallow fry them at the end. You’ll first steam them in the Instant Pot, then fry them in there too. Everything in one pot = less dishes! Why Eat Karela If It’s So Bitter? So what are the health benefits? First let me just say I am a FOOD BLOGGER and not in the medical field in any way – but it is said to help with diabetes, cancer, viral infections, and immune disorders. Some studies have shown that the properties in bitter melon indicate anticancer and antiviral effects. I obviously do not suggest trying to heal yourself without first talking to a doctor. There can also be adverse side effects to eating bitter melon – do not eat this fruit if you are pregnant, trying to get pregnant or might be expecting (read more about bitter melon here). I really enjoy eating bitter melon and I personally think that’s a good enough reason – the potential health benefits are certainly a plus. 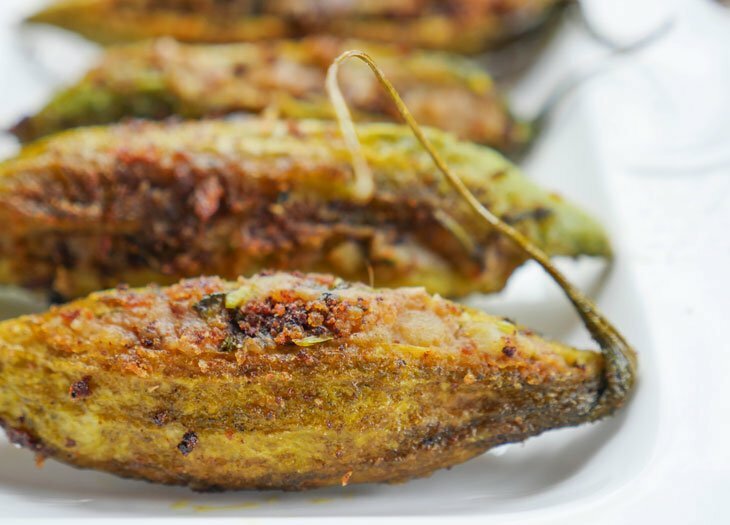 Now let’s be honest here, eating this stuffed karela with a potato filling probably isn’t the healthiest way to eat bitter melon so if you prefer a healthier version of stuffed karela then try this recipe instead which calls for an onion masala filling. 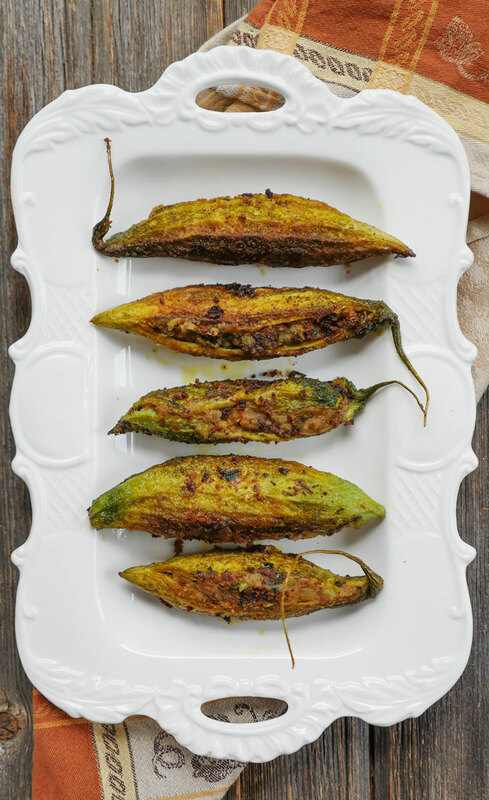 I like to shallow fry the stuffed karela in mustard oil because it has a very distinctive flavor that pairs nicely with bitter melon. You can find mustard oil in any Indian grocery store or on amazon (I like this brand of organic mustard oil) Before I get into trouble with the US government here, you should know that in the US – mustard oil is sold for “external use only.” You’ll find that unsettling disclaimer in small words on the bottle but please know that Indian people use it all the time for frying their food. You can certainly use another type of oil if you’d like. If you’re interested in learning more about mustard oil, here’s a study that was done in 2004 by The American Journal of Clinical Nutrition which found that the “use of mustard oil, which is rich in α-linolenic acid, was associated with a lower risk than was use of sunflower oil”and here is an interesting article by the NY Times. I am not a doctor or a scientist or anything other than a foodie so take from that what you will and make your own decisions. If you try this dish, let me know what you think of it!